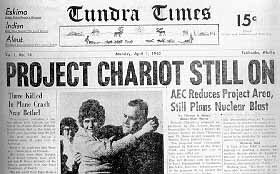 A 1945 newspaper covers Project Chariot. 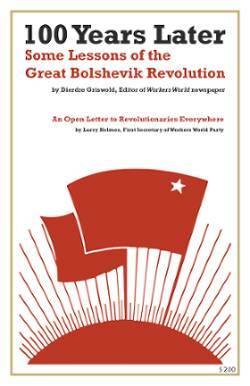 Fairbanks, Alaska — “Plowshares” was a propaganda effort fostered by President Dwight D. Eisenhower to convince the world that nuclear weapons, which the U.S. had used to slaughter hundreds of thousands of Japanese civilians, had peaceful uses. In 1958, the Atomic Energy Commission — today the Department of Energy — came up with Project Chariot, a proposal to use nuclear bombs to create a port in northwest Alaska, on the Chukchi Sea. For over 50 years, the Inupiat community of Tikigaq, called Point Hope in English, along with their allies in the Native communities of Alaska and the worldwide anti-nuclear movement, has been struggling against this proposal to bomb some of their traditional hunting grounds, as well as the consequences of preparing for such explosions. The economic justifications for Project Chariot were totally specious. In addition, while the AEC projected at least six explosions, it completely discounted the environmental and biological hazards involved. The Ogotoruk Creek site that the AEC picked is about 32 miles southeast of Tikigaq and was a vital source of caribou, bird eggs and sea mammals for that community. The AEC picked this site because it was “desolate,” ignoring the 700 to 800 people in Tikigaq, which is one of the oldest communities in North America, going back at least 2,500 years. Its subsistence depends on large sea mammals like whales and walruses, which pass close by and which require a large number of people to process. Rachel Naninaaq Edwardson, a videographer from Barrow, another Inupiaq community north of Tikigaq, made a video for the North Slope Borough School District in 2012 on the history of Project Chariot. Her video shows a geiger counter at the Ogotoruk Creek site pegged to its highest reading. The Department of Energy claims it undertook remediation in the early 1990s. The DOE, along with the Army Corp of Engineers and some Alaskan state agencies, held a public meeting in Point Hope this March 10 to explain the further remediation steps they are planning to take in August. Jack Schaefer, mayor of Tikigaq, told the press: “They’re trying to cover this up. The concerns we have are the [nuclear] devices that were placed in there, and they’re saying, ‘Don’t worry, be happy. '” (Alaskan Dispatch, March 5) There is growing concern in northern Alaskan communities that their high cancer rate is due to radioactive contamination. Such contamination is a hot issue in Alaska currently, with the state Legislature calling for monitoring of the northern Pacific to warn the state of any contamination from the Fukushima meltdown. Journalists and historians have tried to rebut claims that the AEC buried nuclear devices at the Ogotoruk Creek site, pointing out that no holes large enough for the bulky bombs of the 1950s were dug there. However, the DOE still has not declassified all the documents from Project Chariot. And they have not offered to pay for a ground-penetrating radar scan of the site, which could reveal buried bombs. Eid proposed extending federal civil rights laws that apply in the lower 48 states to Alaska and said that if the DOE and the state of Alaska want to fully gain the trust and confidence of the Native communities, they should declassify all the documents from Project Chariot and other nuclear tests in Alaska and fully fund a Native-community-controlled investigation. “The Firecracker Boys” is the source for facts in this article not otherwise credited.